Our third (but not last!) 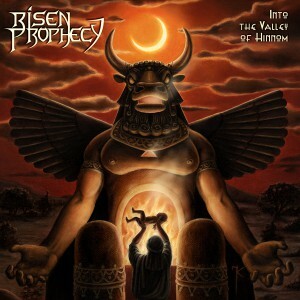 April 24th release is the 2nd full-length album of RISEN PROPHECY "Into the Valley of Hinnom". These young British lads have impressive technical chops and the most brilliant sense of song crafting, which has resulted in a really mature album with highly developed, epic compositions. And to top it off, they have a charismatic singer with really powerful pipes and quite a theatrical delivery of both clean and more brutal, snarl-like, vitriolic vocals, as well as ear-splitting screams. Old school thrash mixed with power metal (of the US kind), reminiscent of bands like ICED EARTH, UNEARTHED (which is basically like early Iced Earth), TESTAMENT, SABBAT, SINDROME, DEFIANCE, ARTILLERY, HELLHOUND, MAELSTROM (NY), JUDAS PRIEST or FORBIDDEN, is what's on offer here. Those attending the Keep It True festival will have a chance to buy the new RISEN PROPHECY CD, as well as the other 4 new releases (DARK QUARTERER "Ithaca", STONEGRIFF "Come Taste the Blood", ARKHAM WITCH "Get Thothed Vol. I" and VV.AA. "Compendium of Metal Vol. 8"), and the older titles, directly from us there (as always, we'll have a table space for selling there). Find out more about "Into the Valley of Hinnom" and see the high-res cover on the page of this release. 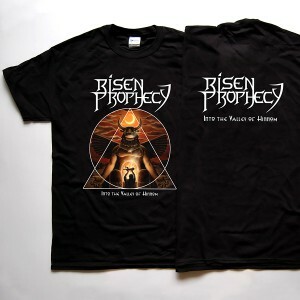 You can pre-order RISEN PROPHECY "Into the Valley of Hinnom" CD from our SHOP page until April 24th, with 2 Euro discount. We made it available also in a convenient bundle with a T-shirt with the album art design. All pre-orders will be shipped first, between April 21st and April 28th, from Germany. The album can be also pre-ordered as digital download (in lossless formats) from our Bandcamp page. Later on, it will be distributed digitally by CD Baby and made available also from iTunes, Amazon MP3, eMusic and other retailers.